Looking for a Used Focus RS in your area? CarGurus has 116 nationwide Focus RS listings starting at $26,000. Prepare yourself for a furious little Ford with giant-slaying performance and a luxury-car price tag. Europeans did this to us. They made us crave the Ford Focus RS, a street-legal rally car with way too much turbocharged power driving the front wheels. That was in 2009, and only in 2016 has Ford’s European division brought its most feral Focus RS yet—with torque-vectoring all-wheel drive. How wild is this winged terror? We tightened our helmet and shut down an entire racetrack to assess its ferocity. The current Focus has remained a fine-looking car since its debut for the 2012 model year and after a mild refresh for 2015, especially as a hatchback. 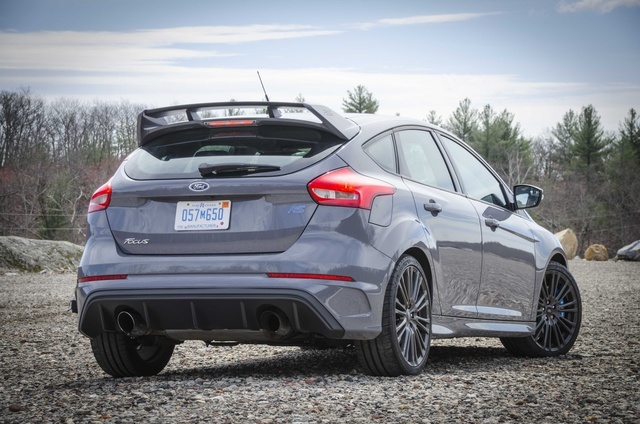 Ford Performance did not exaggerate the Focus RS into some half-wit tuner experiment. They’re the engineers and designers responsible for the dune-jumping Raptor pickup and the high-revving Shelby GT350, so they know when to drop their sketch pens. An angry open-face grille features real metal mesh. 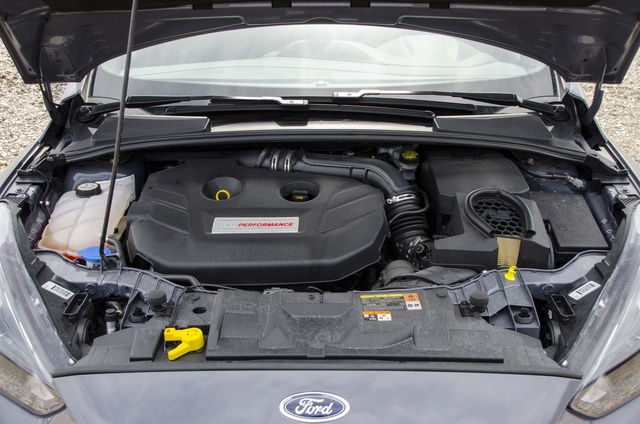 That’s a rarity on modern cars, but Ford didn’t want to anger customers with melted plastic. There’s considerable heat gushing from the engine bay, and those lower air scoops cool the brakes, radiator, and intercooler. Similar function applies to the decklid wing, fat dual exhaust pipes, and fender flares. The showiest bit might be the blue-painted Brembo brake calipers popping out from behind the gray-painted 10-spoke wheels. You can match the brakes with screaming Nitrous Blue body paint for $695, but I preferred the subtlety of our car’s Stealth Gray. Ford’s restraint against larger wheels, hood scoops, and decals is most commendable. They’ve styled a hot hatch like a teenage boy dressed in a suit. It’s respectable and even mature on the outside, but underneath it's a raging soup of chemicals inching to explode. Inside, Ford sprinkles a few special parts you won’t see on a loaded Focus Titanium. 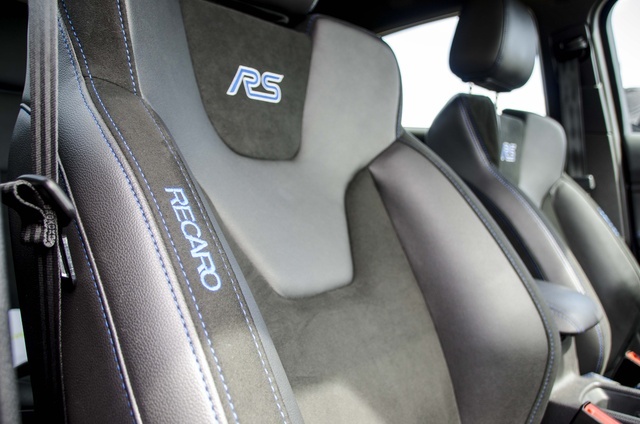 The RS has Recaro leather seats with microsuede inserts and a flat-bottom steering wheel, both adorned with blue contrast stitching and blue RS badges. Also included: aluminum pedals and RS door-sill trim, a trio of auxiliary gauges (oil pressure, oil temperature, turbo pressure), and two new buttons by the shifter, one to select drive modes, the other to disengage traction and stability control. Normal Focus models make you wade through several screens on the instrument cluster to switch off DSC. Everything else looks good, alright? Let’s get on with the driving. We visited Palmer Motorsports Park on a sunny, 65-degree afternoon, the perfect conditions for a turbocharged engine desperately trying to keep itself cool and a set of Michelin Pilot Super Sport tires that must keep warm. This is a 2.3-mile circuit spread across 75 acres of rocky forest in central Massachusetts. With 15 turns and 500 feet of elevation change, Palmer doesn’t stay flat or straight for more than a few seconds. And that’s how the Focus RS likes to play. In Track mode, with its two-way Bilstein dampers set to the firmest setting, I’m slicing through Palmer’s S-turns and steep, banked curves with the steely confidence of a tax attorney. 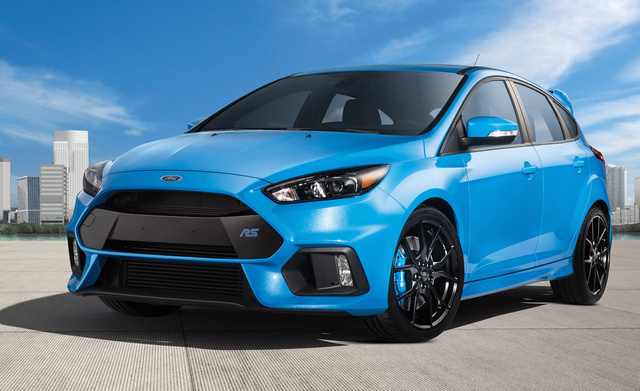 The all-wheel-drive system can route up to 70 percent of power to one rear wheel, and together with a rear axle that operates like a limited-slip, the Focus RS is always secure in the most nail-biting situations. Like the Nissan GT-R and other sports cars costing twice or three times as much, the Focus RS encourages you to dip into the throttle early before exiting the turn. This is a recipe to spin a traditional sports car with rear-wheel drive. But this little Ford splits the power so immediately that any slip—and any mistake by the driver—is easily corrected by overdriving the outside rear wheel or sending additional thrust to the front axle. The short wheelbase and quick steering (with loads of road feel) help out. In Drift Mode, the car is more willing to rotate, yet that mode doesn’t automagically send it into Travis Pastrana slides. That’s okay by me, because while I’ve lapped lots of tracks (including Palmer in a Lamborghini Huracan), I appreciate a high-performance car that lets me have a ball and keeps me safe within my own limits. Even with four people aboard, the Focus RS is so balanced and predictable at the limit that it would take a fool (or a teenager) to upset the chassis. That didn’t stop me from oversteering and catching slides, of course. All that sideways surge comes courtesy of a 2.3-liter 4-cylinder making 350 horsepower at 6,000 rpm and 350 pound-feet of torque at 3,200 rpm. While there is noticeable lag below 2,000 rpm, when you feather the clutch at higher revs from a dead stop, the engine pulls as hard and uniformly strong as a naturally aspirated engine. Activate launch control, and the RS will invite you to dump its clutch at an absurd 5,000 rpm. That’s an easy way to eat expensive mechanical parts, but given that they’re warrantied by Ford for 60,000 miles and you’re loyal to the owner’s manual, the Focus RS could do this every week. Shift throws are short and accurate. Gear ratios are nicely spaced, and the clutch spring is heavy. Braking is exceptional, as you’d expect based on those Brembo logos. And the active exhaust with backfire pops at every upshift? In this car, I am Travis. But all this hot-rod gear will screw up your commute. The car darts around like a front-wheel-drive car when you’re merging onto a highway flat-out—pretty scary when you’ve got one hand on the wheel about to shift gears. Even in the standard Normal mode, it’s nervous, droning, and not that comfortable in poor weather or over long distances. That clutch is difficult to modulate in traffic and always puts your left calf muscle to work. Get on some bad roads, and the suspension will remind you how bad they are. 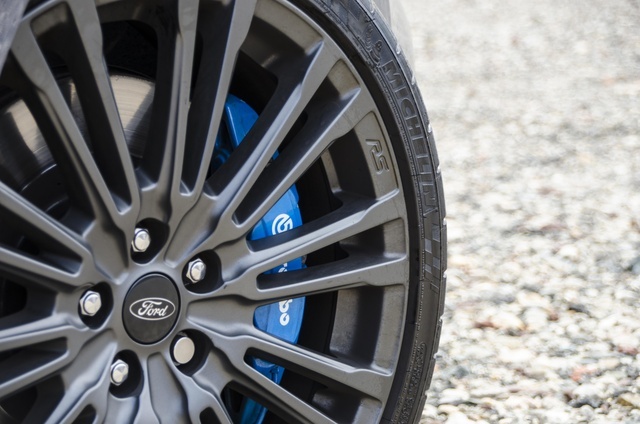 As practical as an all-wheel drive hatch might seem, the Focus RS requires a daily back readjustment. For speed with luxury, you’ll need to spend upward of $70,000. Remind yourself of that the next time you see this Ford’s $40,000 sticker. There’s no way around it. 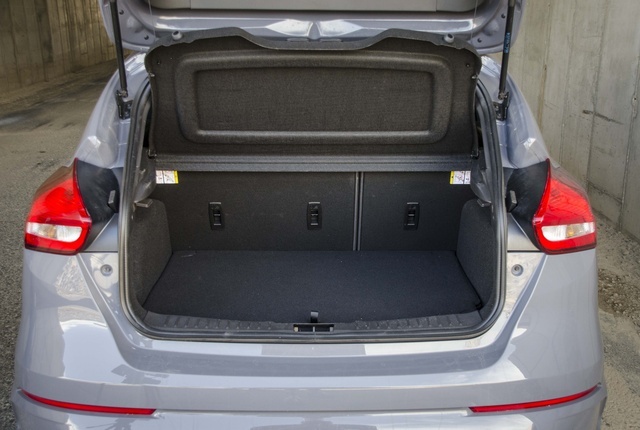 The Focus RS is a small car with tight legroom, tight headroom, a tight cargo hold, and super tight seats that press the air out of your lungs when turning. When you get past the size, everything is simple and easy to use, like the Sync 3 infotainment system. It’s fast with incredibly accurate voice recognition for addresses, POIs, phone contacts, music, and anything else you’d divulge to your car. Radio and climate controls, the steering-wheel buttons, gauges, storage spaces—no complaints. You can drive the Focus RS like a normal Ford. Sync 3 is leagues away from MyFord Touch, the laggy, buggy interface Ford levied on us all for years. Sync 3 behaves like a fast tablet, and it’s right up there with Fiat Chrysler’s Uconnect system in terms of capability, design, and simplicity. 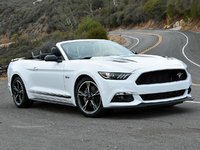 Ford offers wireless updates when connected to an external Wi-Fi network, Apple CarPlay, Android Auto, and various downloadable apps like Spotify. LED headlights, taillights, and running lights look sharp and clear. Our car’s heated steering wheel and heated seats came with the RS2 package ($2,785), which also includes an eight-way power driver’s seat, heated outside mirrors, the optional microsuede inserts (Ford calls the material Miko-Dinamica), and navigation with SiriusXM traffic. A sunroof is extra for another $895, which our car didn’t have. The 2017 Focus RS (in RS trim, not just a regular Focus) was crash-tested by the National Highway Traffic Safety Administration and earned a 5-star overall rating. It scored a lower 4 out of 5 stars in frontal crash and the driver’s side crash ratings. The Insurance Institute for Highway Safety has not tested a Focus hatchback but tested the 2017 sedan. It scored the top Good rating in four out of five crash tests save for an Acceptable rating for the small frontal overlap test. There are no driver-assist or crash-prevention technologies like auto-braking on any Focus model. An all-new Focus is coming for 2019 that will likely include those features plus a stronger body shell. Spending 40 grand on a small car without a luxury badge will prompt questions about your financial risk, except the Focus RS is holding resale value like a Porsche. Due to high demand and limited production, most Ford dealers are selling the Focus RS at well over sticker price. Buy one of these cars, and not only will the Focus RS reward you with Porsche levels of performance, it’s guaranteed to sell at a premium three years from now, if not much longer. Throw in a day at Ford’s RS Adrenaline Academy (included in the price), and you’ll get to tear around a track in another Focus RS that doesn’t belong to you, like we did. This is a race car in an ordinary wrapper. A Volkswagen Golf R is more refined but not as fun. Its only true competitors are the Subaru WRX STI and the discontinued Mitsubishi Evolution. Those are high standards, and the Focus RS has no problem meeting them. 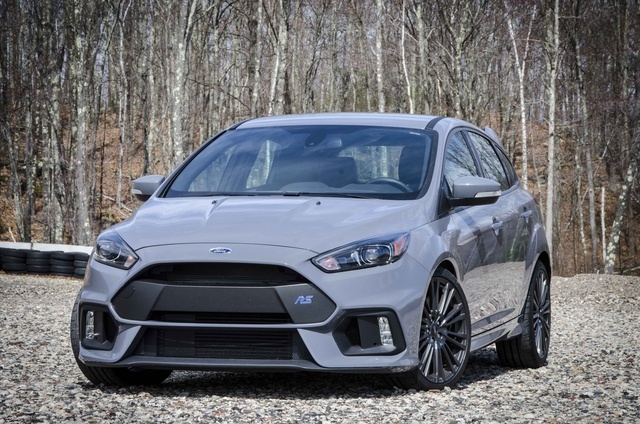 What's your take on the 2017 Ford Focus RS? Users ranked 2017 Ford Focus RS against other cars which they drove/owned. Each ranking was based on 9 categories. Here is the summary of top rankings. Have you driven a 2017 Ford Focus RS?